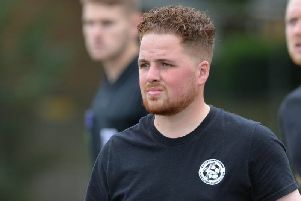 Lutterworth Athletic need to lift their game or face getting hurt in their remaining fixtures. That is the view of boss Mike English who watched them go down 3-1 against Raunds Town last weekend. “We’ve got a particularly tough run-in with games against Buckingham, two against Whitworth and two against Melton,” he said. “They are sides who are all up there and there is no one that will give us a soft game. “We tend to raise our game against the better sides and that’s what we will have to do. “If we don’t, you can bet your bottom dollar that we will get hurt. The loss to Raunds had a familiar feel to it as they conceded three first-half goals before staging a second-half revival. And English added: “We keep putting ourselves under pressure by conceding soft, early goals. “Raunds did a good job on us and probably slightly deserved the win. “They let us dominate possession but caught us on the counter-attack. “They had one player who we had highlighted could hurt us and he scored a hat-trick. “We got back into it in the second half and had great chances to score.